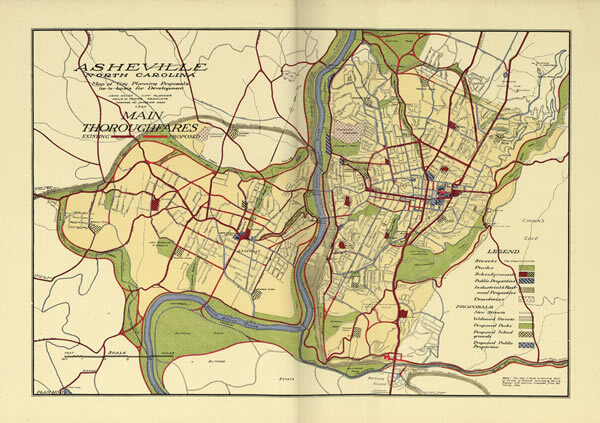 This aerial view of Asheville in the late 1920s emphasizes the city’s growth in the 1910s and 1920s, and also the impact of the automobile on the city’s development. Throughout the period, new structures and real estate development dramatically changed the skyline and automobiles expanded access to its downtown. In the space of twenty years the town’s population soared from less than 20,000 to over 50,000. Visible on the cityscape in this picture are (1) the Buncombe County Courthouse (1927 – 1928) and the dramatic Art Deco masterpiece Asheville City Building (1926 – 1928), (2) the Jackson Building (1923 – 1924) on Pack Square, and (3) the Grove Arcade (1926 – 1929) and a new Battery Park Hotel (1924). This great building boom began to falter in the late 1920s and came to a halt with the 1929 Stock Market Crash and ensuing Great Depression. The Grove Park Inn, a premier Asheville resort, offers people vistas of Asheville and the Blue Ridge Mountains. 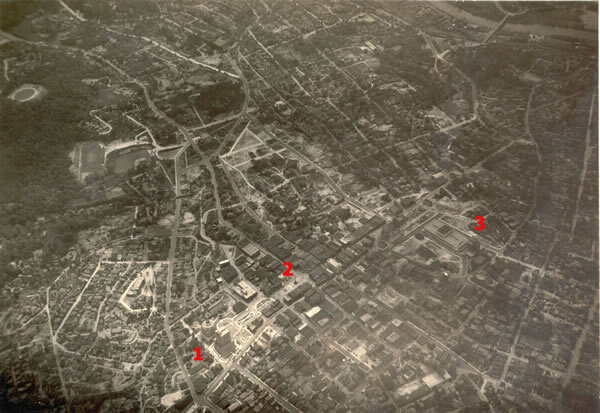 In this view of the city’s skyline are seen (1) the 1903 Buncombe County Courthouse with its cupola, torn down in the late 1920s; (2) the Jackson Building on Pack Square; (3) the Langren Hotel, on the corner of Broadway and College Street; (4) the Vanderbilt Hotel; and, (5) the new Battery Park Hotel, built in 1924. 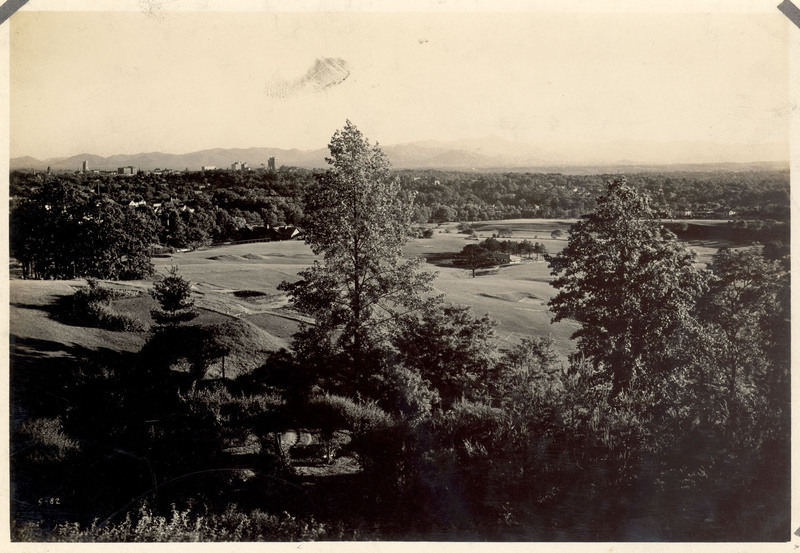 In the foreground is the Grove Park Inn golf course. Asheville Chamber of Commerce. Asheville, “In the Land of the Sky”: Where to Go, What to Do, What to See. Asheville Chamber of Commerce. N.d.
Bell, John L. Hard Times: Beginnings of the Great Depression in North Carolina, 1929 – 1933. Raleigh: North Carolina Department of Cultural Resources, Division of Archives and History, 1982. Carriker, Frederick Thompson. “Wheels of Progress: The Social and Economic Ramifications of the Automobile in Buncombe County, 1930 – 1939.” M.A. thesis, Western Carolina University, 1996. Ireland, Robert E. Entering the Auto Age: The Early Automobile in North Carolina, 1900 – 1930. Raleigh: Division of Archives and History, N.C. Department of Cultural Resources, 1990. Johnson, Bruce E. Built for the Ages: A History of the Grove Park Inn. Asheville, N.C.: Grove Park Inn and Country Club, 1991. Nolen, John. Asheville City Plan: MCMXXII. Asheville, N.C.: [s.n., 1925].